On the Outer Banks, most all parasailing excursions are conducted first with a boat ride into the open water. 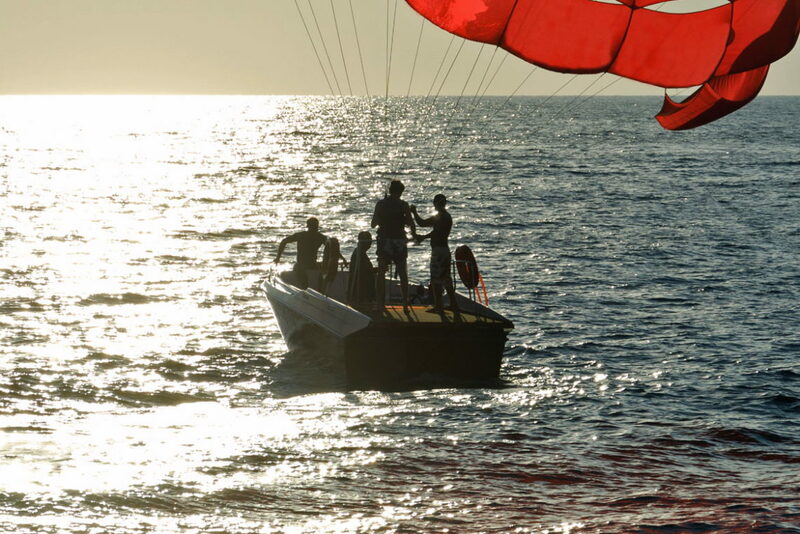 As the small boat find an ideal "launching" point, the rider is hooked to both a harness connected to the boat, and a giant parachute that will allow them to be carried up into the atmosphere. 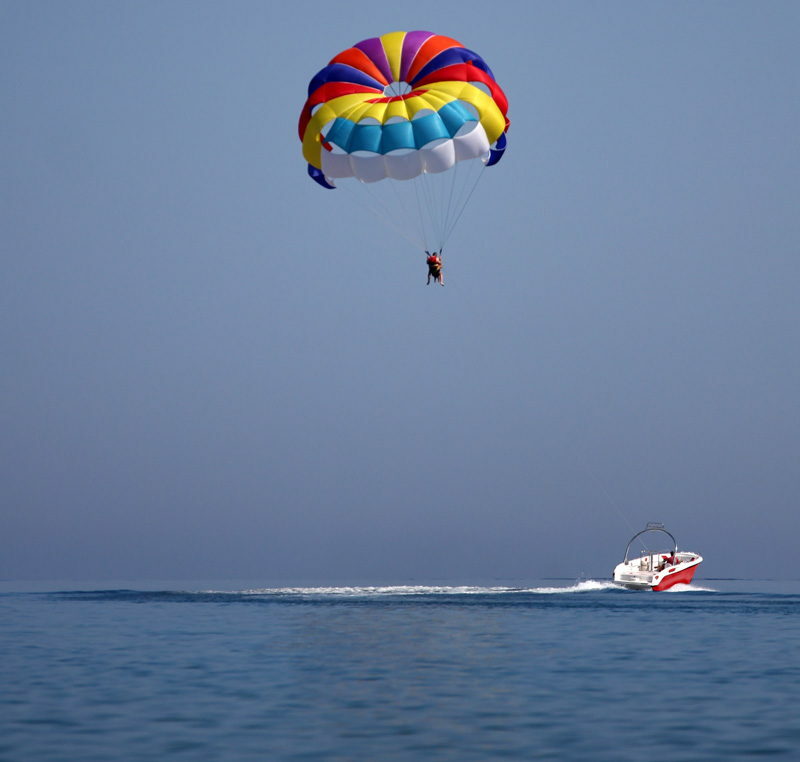 En route, a professional is on hand to offer helpful tips and guidance on what to do once propelled mid-air, and parasailing patrons will have two options of how to fly. They can ride solo and enjoy the ride by themselves, or they can ride in tandem, with two parasailers sitting side by side and connected to the same parachute. Newcomers may want to bring along a friend to take the fear out of the first lift-off, although solo riders will find plenty of peace and quiet while hovering over the bustling Outer Banks beaches. Most all parasailing adventures also launch over the local sounds, including the Currituck, Roanoke, Croatan and Pamlico Sounds, ensuring an easy boat ride out to the water as well as an uncongested and open water area to cruise around in. The sounds also provide incredible views that span from the open salty waters to the neighboring villages and towns, and extend all the way to the oceanfront. From 600' feet, 900' feet or even 1200' feet above sea level, it's not too difficult to scope out all portions of the Outer Banks landscape. Once your navigator has found the perfect launching spot, and the parachute has been inspected and deemed ready for launch, a parasailer will stand at the back of the boat while the motor boat picks up speed, causing the parasailer to drift into the air, gradually at first, and then rapidly until they are hovering well above the boat and the Outer Banks skyline. Granted, the initial take-off can be a little scary, and even a little disorienting. The harness somewhat forces the rider into a comfortable sitting position, with their legs dangling, and with limited options to move available except to sit back and enjoy the ride. The initial incline takes only a minute or two, but like a roller coaster, can feel virtually endless, particularly to newcomers who have never experienced parasailing before. After the ascent, however, and well after the butterflies have subsided, most riders soon discover a feeling of being completely at east. The harness is comfortable and protective, and although the motor boat as well as the rest of the ground may appear to be miles away, the huge parachute floating above provides an extra layer of security and the rider can take a moment to collect their bearings and enjoy the view. Parasailing is not a speedy sport, and instead of a frantic trip skimming across the open water, most first-time parasailers are surprised to discover that a parasailing ride is actually pretty relaxing. The boat moves slowly across the open water, allowing the parachute to simply glide along, with limited variations in height and providing a smooth ride simply gliding across the open water. Above all else, (no pun intended), be sure and take time to enjoy the view. The vistas from this vantage point are rivaled only by airplane tours, and once a rider is accustomed to the gentle sensation of simply floating along with the breeze, there's no excuse not to relax and take in the Outer Banks at their best. At the end of the ride, the boat will slow down, and / or may begin the "reel" the parachute in, similar to a kite, to the point that the parachute lowers back towards the water, and the rider is slowly but safely guided back towards the boat. Parasailing rides can generally last anywhere from a quick 10-15 minute glide through the skies to an hour long tour of the respective sound and the surrounding areas. Check with your local parasailing company to see what is available, and don't be afraid to take the trip. Though an initially scary concept, parasailing is a fun, safe, and even relaxing way to see the Outer Banks from a bird's eye perspective. From the northern beaches of Corolla and Duck to the southern tip of Ocracoke Island, virtually every town has a watersports or parasailing-specific company that is more than happy to take vacationers out on a wild and fun ride. Local watersports giant Kitty Haw Kites offers parasailing tours in almost every one of their branches located from the North Carolina mainland to the Currituck and Ocracoke Island beaches, and a number of small, privately owned local businesses offer parasailing tours as well. As a result, visitors can rest assured that they have plenty of options, regardless of where they are staying. Basically, if there's a sound, there's a way, and any community that borders open access to a saltwater sound will most likely have a parasailing company nearby to provide vacationers with the ride of a lifetime. Vacationers who take to the skies and enjoy the panoramic views deem the cost well worth the adventure, and arrive safely back onshore with an incredible Outer Banks vacation memory that is simply irreplaceable. Visitors should also note that parasailing adventures are seasonable, and are generally available from late May until the early or mid-fall. This seasonal availability is due to both the limited number of expert guides available, as well as the temperatures of the sound waters, which can turn chilly in the shoulder and off-season months, and can make a watery landing a frigid affair. Reservations are also strongly recommended as parasailing adventures fill up fast, particularly on weekdays during the prime summer months of June, July and August, when the tourist season is in full swing. A number of companies allow potential parasailers to book online, or simply operate on standard business hours and provide phone numbers so folks can call and make a reservation. Remember to have no fear when taking the plunge. The local companies on the Outer Banks are experts at providing new parasailers with a simply incredible experience, and well after your parachute has landed, you'll be happy you embarked on this completely unique Outer Banks adventure. The temptation to bring along a top-quality camera is tough to beat, as a parasailing trip over the Outer Banks can provide some of the best photo ops imaginable. That being said, delicate electronics and saltwater do not go together, and even if you make a completely safe and water-free departure and landing from the back of the motor boat, your camera could still be splashed by light sound waves to and from your launching point. Clearly, pictures are a must, but if at all possible, bring along a waterproof camera, a disposable camera, or a waterproof carrying case for your digital camera. This step will not only ensure you don't lose a valuable piece of electronics during your adventure, but that you also capture some of the most incredible views the Outer Banks has to offer. Make sure the first item on your to-bring list is waterproof sunscreen. The Outer Banks is notorious for its intense sun rays, and this is only escalated on the open water. A good dosing of sunscreen will protect you from the harsh rays, and keep you flying high without any worry of a sunburn. Make sure you wear comfortable and waterproof clothing for your parasailing adventure. A sturdy pair of board shorts or a comfortable bathing suit will work nicely, as will a tank top and a comfy pair of shorts. Remember that you'll be strapped into a harness, and launched hundreds of feet into the air, so comfort is key. Fuel up beforehand with plenty of water and a restroom trip if needed. Remember that when you're floating in the air, facilities are limited to say the least. Do your very best to relax and enjoy the ride. Once the complete thrill of the launch has subsided, a deep breath and an unbiased look around can go a long way in admiring your surroundings. After launch and before descent, the ride is a gentle glide across the skies, after all, and is inherently designed to allow riders to simply enjoy the sensation of looking down on the gorgeously scenic Outer Banks. 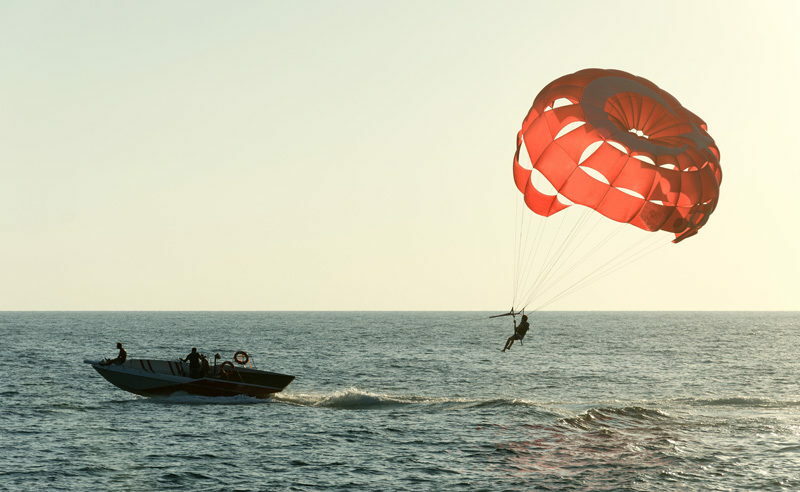 Parasailing is an incredible sport that virtually every vacationer can enjoy. Young and old, solo or tandem, a parasailing trip across the open sound waters can provide OBX visitors with both a unique thrill and a perspective of this chain of barrier islands that is generally reserved for birds and airplanes. On your next summer Outer Banks vacation, why not challenge yourself to a parasailing trip, and see what new heights you can reach? After discovering the sound to ocean vistas, and the free-floating feeling of lingering hundreds of feet into the air, it's a safe bet you'll be back to your local parasailing provider year after year for another sky-high ride.